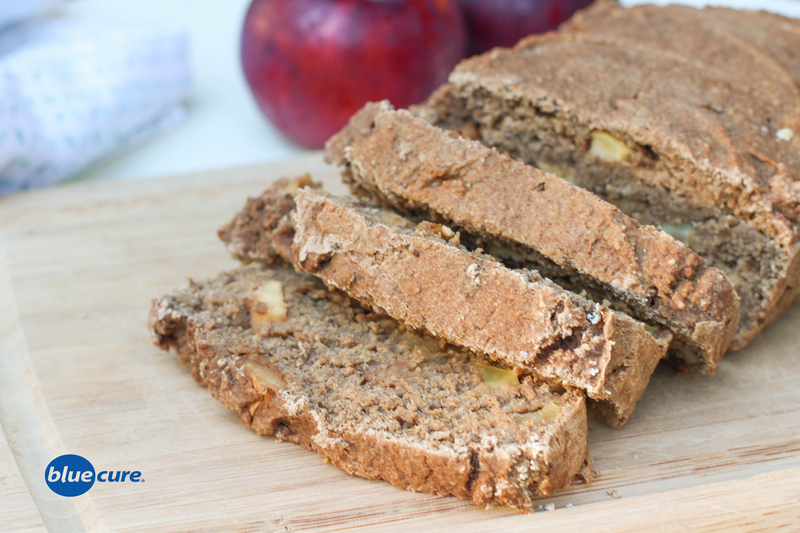 Apple walnut bread is perfectly sweetened with nothing other than fruit. Most apple breads call for some kind of refined sugar (e.g. cane sugar, brown sugar, maple syrup), but this recipe is just sweetened with applesauce, apples, ripe bananas, and spices. It’s also made with oat flour rather than white flour, so it’s packed with more nutrition and even gluten free for those with celiacs disease. Enjoy it for breakfast with some nut or seed butter or have it as an afternoon treat. Leave the skins on your apples to maximize the antioxidant power of the bread! Add the oats to a clean, dry blender and blend until the oats become fine like flour. Pour the oat flour into a bowl and set aside. In the blender, combine the applesauce, bananas, and vanilla. Blend until smooth and set aside. Wash and dice the apples into small pieces (1 inch or smaller). Crush the walnuts with a back of a fork. Next, combine the cinnamon and baking powder with the oat flour. Mix well and then pour the banana-applesauce mixture in the bowl with the oat flour. Stir well until a batter is formed and there are no clumps. Stir in the apple slices and the walnuts. Line a loaf pan with parchment paper (or lightly oil). Then pour in the batter. Place the batter in the oven and cook for 30-40 minutes or until the bread is thoroughly cooked (to test, poke a tooth pick in the bread and if it comes out clean, it is finished). Remove the bread from the pan and allow it to cool. Slice and serve by itself or spread your favorite nut or seed butter on top. Cashew cream is also another tasty, healthy option! Enjoy!